The face, breast, sides, and flank are orangish-buff. The cheek, central crown stripe, and nape of the neck are gray. The chin is light buff. The back is gray with brown stripes. The underparts are finely streaked. The tail is not notched. A series of three insect-like buzzes: long high – short high – long low; entire call lasting less than two seconds. A single, insect-like, warbling buzz, lasting about a second. Insects, spiders, and other invertebrates in the summer, seeds in the winter. This species and Saltmarsh Sparrow were originally thought to be one species, Sharp-tailed Sparrow (Ammodramus caudacutus). In 1998, the species was split. 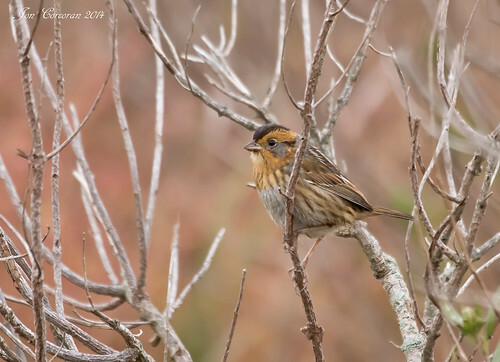 The Saltmarsh Sparrow retained its scientific name and this species became Nelson’s Sharp-tailed Sparrow (Ammodramus nelsoni). 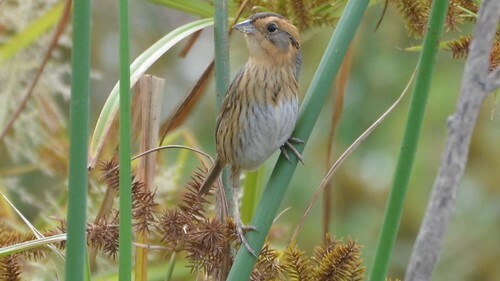 In 2009 the common name was simplified to Nelson’s Sparrow. Nelson's Sparrow (Ammodramus nelsoni) at Great Bay Boulevard Wildlife Management Area in Tuckerton, Ocean county, New Jersey. Shot through a spotting scope. Recorded October 18, 2014. This male Nelson's Sparrow was singing at the top of a small shrub in a sedge marsh having just arrived during the night. This is one of many Nelson's Sparrows that I found in the salt marsh behind Rushton's Beach, Nova Scotia in July 2013.